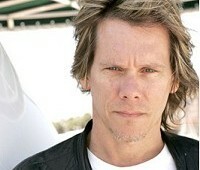 Kevin Bacon: I was the youngest of six kids by a lot of years. The other five were born pretty close to each other and then eight years later I was born. I had an amazing captive audience in my brothers and sisters and I entertained them before I knew what an actor was. The first toy that I can remember was a costume box that my mother gave me. It was this gigantic chest that lived in the living room and it was filled with old clothes and costumes and pieces of fabric. I would just dig in there and become somebody else. I also had a rack in my room, like a hat rack, with six or eight hooks, and there was a hat on each of them, an Indian headdress and a raccoon skin cap and a sailor hat. And I would take one down and put on a different hat and become whoever that was, and that's still what I'm doing. Was working on Animal House as anarchic as it looks? It was a great experience. It was kind of overwhelming to see this amazing process, with these cameras and all these people - the slate and the boom and all these things that you've pictured or seen in movies - and just to see it all happening. The strange thing about that movie is that it's thought that it must have been this great party, and it was. The only problem was that I wasn't invited. In the film there was this thing between the Delta house and the Omega house, and off-camera those lines were kind of drawn — there were the people who were cool, the people in the house that I wasn't in, the cool fraternity in the movie. They had parties and they had girls. But those of us who weren't in that fraternity were outcasts. I'd hear their parties going on and I'd walk past and knock on the door and they'd be like: "What do you want" and close the door in your face. It was terrible. While it was a lot of fun to see it, I was on a little bit of shaky ground. What about Footloose five years later? It definitely was a life-changing event. When I was a little kid, what I really wanted to be was a pop star. I wanted to be on the cover of teen magazines. I wanted to be Bobby Sherman or David Cassidy. But by the time I made it to New York and started going to the theatre and taking acting classes and looking at Broadway and off-Broadway, I didn't want to be there anymore. I wanted to be Meryl Streep and Robert DeNiro and Dustin Hoffman. 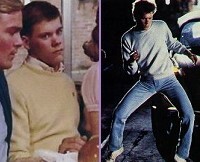 Then Footloose came out and I was a pop idol - and it was exactly what I didn't want. They would ask me to be on the cover of magazines and I'd say: "I'm not going to do that." I fought them about being on the cover of People magazine. Of course now I'd kill to be on the cover of People magazine, which is kind of pathetic when you think about it. Did you not have any idea it was going to be such a massive hit? Nobody could anticipate the scale of it. Honestly. I didn't even know when I read the script that it was really a dance movie. They said that the guy dances, and I said to the director, "I'll dance, just turn on the music." The use of the music and the use of the soundtrack in order to break the movie was a completely new thing - it was unique. Some of those songs were smash hits before the picture even came out, and it was just a phenomenon - I don't think anybody really expected it. You have described the 10-years after Footloose as a period of total failure. Then there was that one scene in JFK. Can one scene really be that pivotal for a career? Well, I was spinning my wheels. Far be it from me to give agents any credit at all, but my agent at the time, whose name was Paula Wagner, said to me, "Look, I saw you on the stage in the late '70s in New York and you were doing these edgy parts — Glasweigan teddy boys or gay hookers — and you've kind of lost that in the movies." She said: "I think what you need to do is find something edgy and work with— good, interesting directors — and don't worry about the size of the role, or what it's going to do for your career. You need to go back to being a character actor." So the first thing she set me up on was JFK. There are so many parts in this movie, and Oliver Stone said: "I've got this guy, gay, fascist kind of psychopath in prison. Will you be able to be transformational? Will you really go for it?" And I said sure — what else am I going to say? Literally, the movie came out and the phone started to ring, and I worked only four days on it. It really was incredibly important and really turned things around for me. Since then your films have been darker. I am oftentimes drawn to the films that touch on subject matter or characters who are struggling with some kind of darkness. That's partly because of my theory that human beings have that. We have sadness and anger and extreme sexuality and violence, and all these things are living in our souls whether we want to admit it or not — and in a way sometimes I think I get a chance with movies to sort of exorcise some of my own demons. With The Woodsman, I didn't want to do a dark film, but the character was just too good. After The Woodsman I was happy to go away and do Beauty Shop with Queen Latifah, which was really fun because I only worked for six days on it, and I play a hairdresser and I was just able to have a great time. Right away I'm back in a movie with Atom Egoyan, a great Canadian filmmaker. He was good enough to cast me in a part, which again explores sort of the darker side of life. I'm getting a chance to work with Colin Firth - he's great. It's dangerous kind of territory, so I don't only want to be the dark guy, but sometimes, that's where the good s**t is. Murder in the First was especially dark. How about he scene where you're naked with the rat crawling on you? That was rough. I was naked, and they had a scar on my leg, and they put some peanut butter in the scar, and then the rat was coming up my leg, and he's supposed to stop at the peanut butter, but I don't know, he wasn't in the mood for peanut butter, and he kept walking up my leg, and I'm like: "The director's not saying cut," I thought. "You've got to be kidding, this rat is on his way where he really shouldn't go." That was one of the many fun moments of Murder in the First.